In the village of Antikva Wire, is attempting to sell sensitive information hacked from Tiger Wylde's computer systems. His close friend Xandra steps in when the buyer refuses to pay Wire's price. As she attempts to persuade the buyer with her knife, they are caught by Guardsmen. Wire and Xandra attempt to lose the Guardsmen in the ruins of an old castle. Suddenly a figure appears from nowhere, Doctor Doom. When the Guardsman threaten Doom he retaliates and kills them. 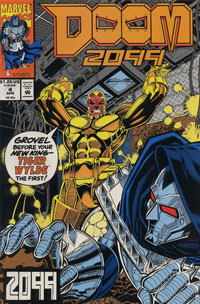 Doom learns that he is in the year 2099, the castle has been in ruins for years and Tiger Wylde rules Latveria. Making his way to the capital city of Gojradia, Doom confronts Tiger Wylde. Wylde faces him, believing him to be another in a series of Doom imposters. Demanding that Wylde leave Latveria and give up his power, Doom underestimates the cyborg. He is quickly overpowered. Wylde removes Doom's mask, revealing a young and unscarred face. Remembering that Doom was meant to be hideous, Wylde blasts away his face. Left for dead, Wylde's gypsy advisor, Fortune, saves him from being scrapped and takes him to the Zefiro tribe's camp. There his wounds are tended to until and then he awakens. Doom is formally introduced to Vox, Wire, and Xandra. Doom swears he will overthrow Wylde and free Latveria. Fortune offers her support and that of the tribe. Together they travel out of Latveria to an island owned by the PIXEL corporation. Infiltrating the science facility there, Doom offers Dr. Quinones, a slave scientist, her freedom in exchange for her services as a neurosurgeon. 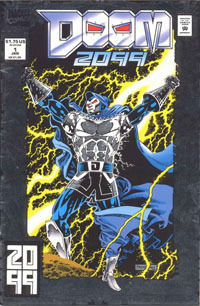 The doctor agrees and operates on him, after which Doom is now armed with new armor and new technology to face the challenges of 2099. Fortune's amulet belonged to Boris, Doom's long time ally. Doom gave the amulet to Boris in case he should ever need to flee from Latveria. The amulet gave Boris access to a secret hanger built inside the Malhela Mountains. Using robotic couriers, Doom learns all he can about Tiger Wylde and his operations. Having gathered that, he and the others destroy the PIXEL compound where Doom's armor was constructed and return to Latveria. There, Fortune discovers that her people have suffered because of her absence. This leads to tension among the tribe in regards to Doom's method. Fortune remains convinced that Doom is necessary for the overthrow of Wylde and returns to Tiger Wylde in order to mend things. Meanwhile in Antarctica, Rook 7 prepares to run the security of a delivery of tritonium heading for Latveria. After evidence of PIXEL technology is found at the site of a rebel attack, Wylde suspects that PIXEL is trying to double cross him. De Vargas, the head of PIXEL, assures him that no such double cross is occurring. 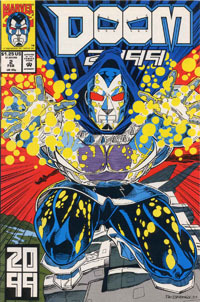 Elsewhere, Doom has Wire and Xandra run and errand for him when they're met by a mysterious freelance agent who wishes to meet Doom. The agent is revealed to be a man name Poet. A master of disguise, Poet offers Doom his support in the fight against Wylde and warns him to be cautious with the tritonium. Ultimately Doom attacks the ship carrying the tritonium himself and engages it's guard, Rook 7. As they fight the plane crashes into the Latverian airport and is totally engulfed in flames. From the flames Doom emerges victorious and declares war on Tiger Wylde. First proper appearance of Poet. He previously appeared in disguise. Tritonium is a rare mineral mined from Saturn's moons. Apparently even a small fragment can generate incredible amounts of energy. Doom mentions he has dealt with "Stark technology" before, alluding to various encounters with Iron Man / Tony Stark over the years. First appearance of De Vargas. Doom has a flashback to his life post-Age of Heroes. Desperate to find the missing tritonium and this new Doom, Tiger Wylde interrogates Alchemax corporate spies with no success. No one knows who Doom is or where he is hiding. Meanwhile Doom makes himself known to the people and supplies the starving with food. 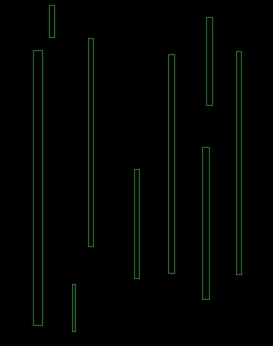 He also has Wire hack into Wylde's defense system and retrieve codes which control all of the countries utilities. By shutting down transportation, waste management, and power, he creates an atmosphere of chaos. 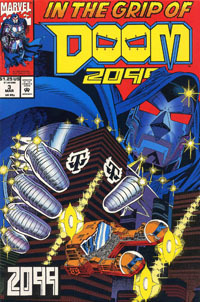 In that, Doom appears to the people via a broadcast hologram and announces that a new day is coming. After Wylde regains control, Zone shows him evidence that Fortune and Doom are working together. At the mountain base, Doom attempts to piece together his lost memory with Vox's help. But the meditation is abruptly broken when Xandra alerts Doom that Tiger Wylde has homed in on their location and his bringing his army with him. Another flashback with clues to Doom's past. The armed forces of Tiger Wylde mercilessly attack the Zefiro who defend Doom's mountain hideaway. Outnumbered and overwhelmed, they quickly surrender. With the entire gypsy tribe in his hands, Wylde demands Fortune to tell him where the tritonium is. Doom appears and tells Wylde that in order to get to the tritonium he will have to fight him for it. Tunneling down to the bottom level of the base, Wylde is lured into a fight to the death. Meanwhile, Xandra together with Vox escape through the ventilation shafts. Outside they are met by Poet who has come with neural grenades to knock out the guardsman pilots. The explosives give the Zerifo the chance they need to break free. In the melee, Poet kills Zone just as he was ready to shoot Fortune. Underneath the hanger, Wylde gains the upper hand and buries Doom under a pile of rubble. As Wylde prepares to claim his prize, the detonator activates. Doom emerges from the rubble and tells him that it was always his plan to blow the tritonium. The hanger and mountain explode apparently taking Doom and Wylde with it. After a few moments, Doom rises from the ashes. Having activated his phase shifter the explosion merely passed through him harmlessly. Three days later, Doom and Fortune stand atop the former Wylde HQ and discuss the future of Latveria. Doom assures Fortune that he has no interest in conquering the world, rather Doom wants to save it from itself. 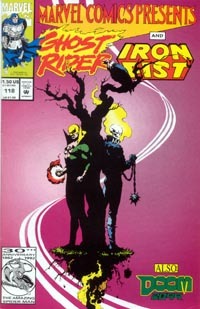 Tiger Wylde apparently dies at the end of this issue but he appears again in issues 22-24. Xandra's clouded past is first mentioned here. She states "The Zefiro took me when I was a stray, hungry on the streets of Antikva Vilago"